Staying in shape and healthy is very important. If you are an avid runner for fun or for your health, you need to take precautions. Taking precautions to prevent running injuries can help you continue to feel your very best. Don’t wait until you actually experience an injury before you make changes in your routine. It is very important that you stretch before and after each running session. Don’t be in such a rush that you bypass doing so. Don’t assume that because it is a warm spring day, you don’t have to stretch to warm up your muscles. Stretching makes the muscles more flexible and that reduces the risk of pulling something during your run. If you can’t quite touch your toes when you stretch, don’t worry about it. Stretch far enough so you can feel it but it isn’t hurting your body. As you become more flexible, you will be able to reach further. Hold your stretches for a count of ten and slowly breathe in and out as you do so. After you run, stretching helps to reduce the risk of cramping. It also helps to reduce the risk of being sore after running. It only takes 5 minutes before and after you run to properly stretch so don’t skip it. In addition to stretching your legs, you should also stretch your arms and your torso. 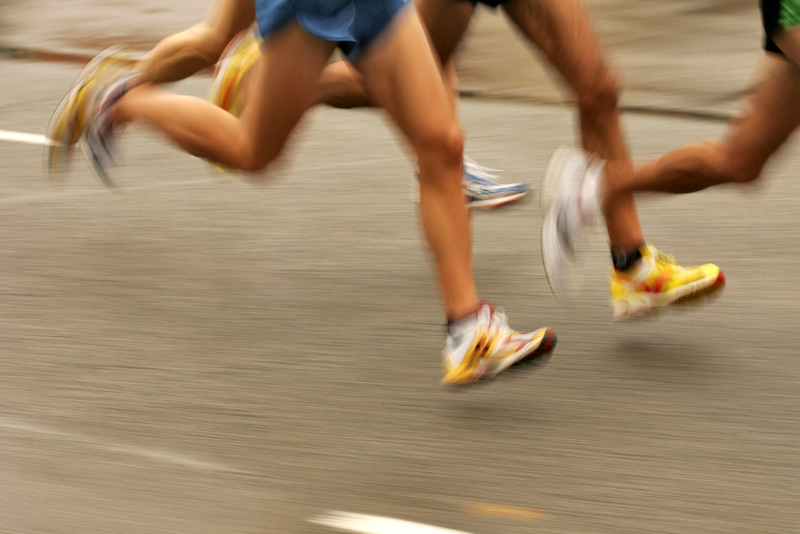 A stronger body means you are less likely to encounter injuries during running. This is because the muscles are stronger to begin with and less likely to experience tears. There are several ways you can go about strength training. Lifting weights a few times per week is a good place to start. You don’t want to lift every day as the muscles actually get stronger during the healing after lifting. If you lift each day, you will slow down that overall strength increase and muscle mass. The weights don’t need to be heavy, you want to focus more or repetitions. Many women worry that weight lifting will cause them to bulk up. That isn’t the case with low weights. Instead, it will help you to get stronger and help you to tone your body. Yoga is another way to take part in strength training. It helps to strengthen your body from the core muscles. As a result, you will be able to see and feel a difference all over your body. You can also take part in targeted exercises. However, you need to make sure you rotate which areas you target each day. For example, focus on legs one day and on your arms the next day. Take your time to perform each exercise accurately to also reduce the risk of injuries. The process of clinical massage & bodywork can help you keep your body ready for running activities. A functional movement test can be performed that will actually help to determine if you are at risk of potential injuries due to running. This type of technology is very advanced and it can help you make positive changes and prevent running injuries. If you enjoy running, continue to make it part of your daily routine. Just make sure you are also doing all you can to keep your body working as it should. Injuries can prevent you from running as well as from taking part in your daily tasks you need to complete. Injuries can also be very painful and take time to heal properly. Preventative measures can help you to prevent running injuries! While running is a great form of exercise for your body and stress relief for your mind, it can be hard on the body too. Clinical massage therapy is a wonderful method to incorporate into your routine for optimum overall well-being.